After an unintentional break of one and a half weeks from blogging, I am ready to post again. That might not seem like a long time but it is for me; blogging is always the one aspect of my life I’ve kept up with regardless of all the other changes in the last few years. I have been feeling rather uninspired lately and I feel frustrated that I have such a terrible camera (am I the only blogger still using a very basic digital camera?) but don’t have the money to buy a new one and probably won’t for quite some time. I will have to do the best I can. This is an outfit I’ve been wearing frequently in recent times. 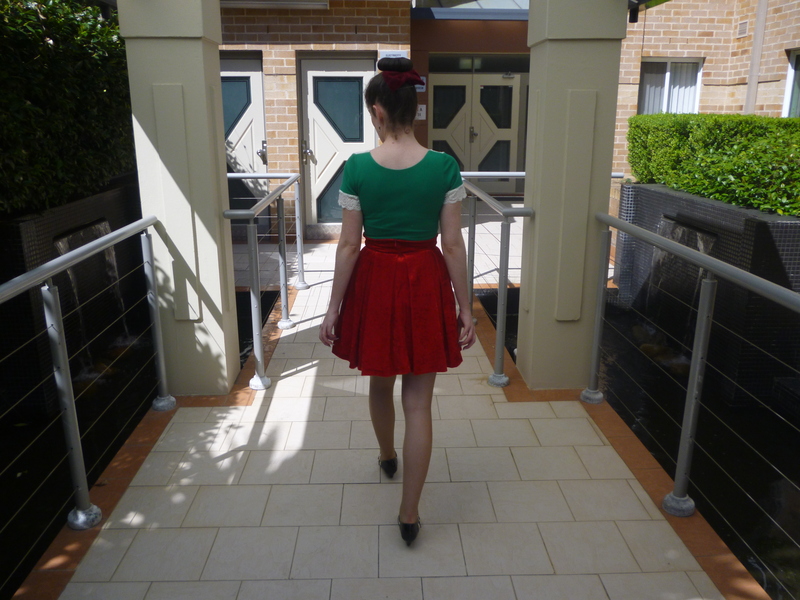 Many people comment on the obvious festive nature of the look (I was even called a Christmas elf at work) but since I don’t like Christmas that isn’t why I’m wearing red and green. I just like these colours together and I love bold combinations (orange and purple is another good one). This is a new top from Kitten D’Amour. I am absolutely in love with it. I also have it in black. It comes in red, blue, black and emerald. I would love to have all the colours but I thought purchasing more than two of the colours would be taking it too far. At $60, this is rather affordable compared to most pieces from Kitten D’Amour. It is also very suitable for everyday wear; in comparison most Kitten D’Amour clothes are more suited to formal/dressy occassions. This top is perfect and I love it so much. The lace and bows are adorable, and it is a flattering shape in a comfortable material. Best marks Kitten D’Amour for this top! The shoes were also a rather exciting find. There are a few pieces that I’ve noticed are common to own in the blogging world. I like that because, although we are spread out all over the world, owning some of these more common pieces makes me feel like I am part of the group. These include many of the Bernie Dexter dresses and the Jenny dresses from Pinup Girl Clothing. In that category I would also include B.A.I.T footwear. I have wanted to own a pair for a long time but was turned off by the high postage charges directly from the US. I tried and locate Australian stockists of B.A.I.T footwear and eventually came across Pretty Dress and bought the pink tbar Ione heels. I was so amazed that I also wanted to add the black version and the mustard yellow pair to my collection. However, that website has only a very limited selection of B.A.I.T footwear so the search continued. However, I became lucky when I found out that Kitten D’Amour now stocks B.A.I.T footwear. Again the selection is not extensive but they had the black Ione shoes that I had been searching for for quite some time. It’s amazing to think that these international shoes I’d been trying to track down for so long turned up in a local store in Sydney. I knew they had to come home with me and I’ very pleased to have found them. They go with everything and the vintage element is perfect. It’s holidays and I’ve still got another 5 days off from work. I’m already feeling lonely and bored. I wish I had friends and I wish I could enjoy things that most people do. The lack of routine and the loneliness makes me slip back into feeling extra depressed, even if it is for only a week of holidays. At the same time I don’t feel ready to face another demanding year of full time work either. But I do hope you all had a lovely break and I look forward to seeing what you received for Christmas! I have a few exciting pieces to show you including my new laptop which I am posting from for the first time right now. It's a lovely outfit!!!! Skirt, shirt, shoes, hair… everything! You look adorable, hun! And I'm sorry you feel sad during these holidays, but hope you can finf somethig good in them as well! The skirt and top are darling! your pictures are always so beautiful! you'll get another camera soon. save what you can and it will add up. a new laptop is definitely more important. i'm just like you: professional, single etc. The holidays can get you down. Have you thought about taking up some hobbies or even starting a blogging group in your area? You guys could meet up once a month and do some things. Do you know Mica from Away From Blue blog? She's a fashion blogger and VERY KIND. Maybe connect with her. I hope you guys live in the same part of Australia. If not, at least it's the same area. One small step leads to other bigger steps. Don't be afraid to branch out. You look so cute! I love that skirt! Love colores, and love your red/green/white outfit, it looks so fresh!! Wish you a happy and successful 2015!! 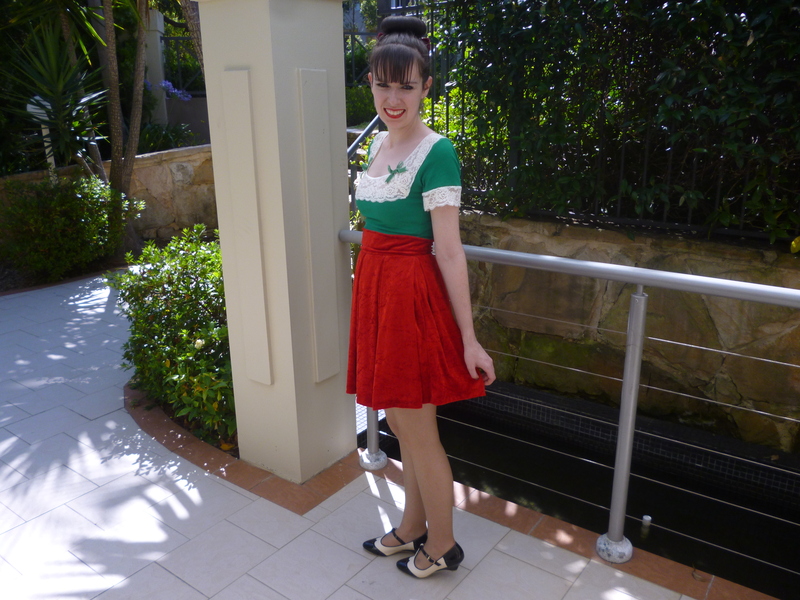 You DO look a little like a Christmas elf in this outfit, dear Imogen…but the chicest, prettiest elf EVER!! I can see why you are so excited about this retro-inspired top; it's totally adorable!! And your black and white, t-strap shoes were definitely worth the wait!! I had to do with a basic camera for almost 5 years of blogging! Finally this Christmas I gave myself a present and upgraded the quality of my photos by buying a professional camera! But don't worry, when you have the passion and great outfits, you'll have a great blog, do your best with what you have! you look so lovely, What a pretty Christmas look!! gorgeous! i didn't take off from blogging and i wish i would have, so good for you! This outfit is so ADORABLE! And I just love how well that neckline frames your face! 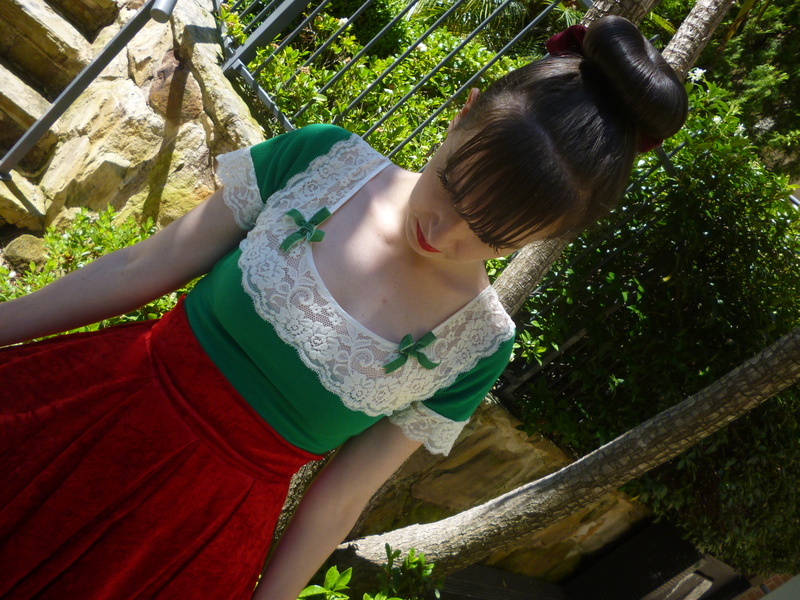 such a fun christmas outfit and that bun is PERFECT! Love! what a lovely holiday outfit! so perfect and cute! I love that skirt. I still use a basic digital camera your photos look good. Loving this look. So festive and fun!! great look for Christmas time! I followed your social media! 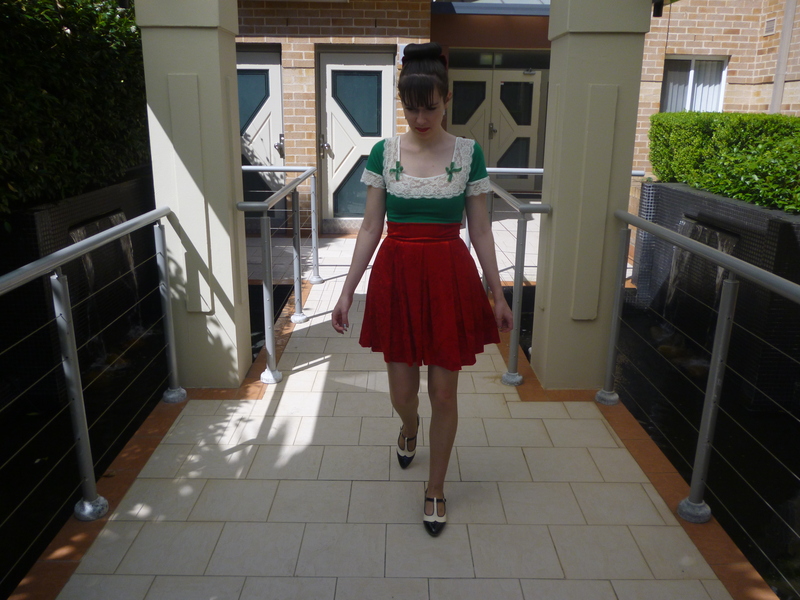 This green and red combination is so cute! Im sorry to read that you feel lonely and bored! I hope the new year will bring you friends and happiness! You look really sweet! 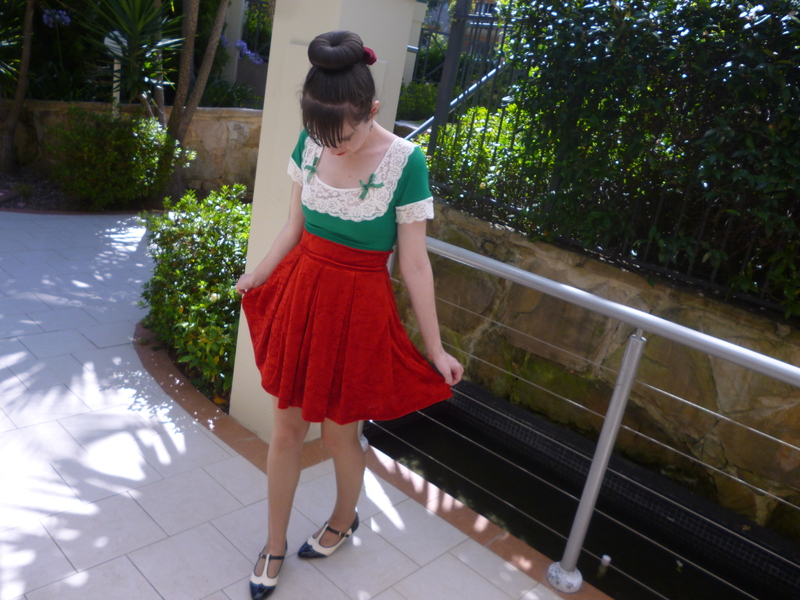 A lovely Christmasy outfit! Darling you look more beautiful than ever. I'm surprised you don't like Christmas; I imagined that you would. I hope it went well though. Re the camera, your photos look good to me. If you wanted to improve them you could use a site like picmonkey…it's free for basic effects and you can improve most pics on there. Love to you for a wonderful year. Lovely recap, you a re always so stulish!!!!! This awesome blog is nice! To be in line with nowadays trends, enjoy yourself in cute clothes for juniors! Will shape you like a charm or a diet. This is such a cute combination! The top is truly gorgeous, no wonder it's your favorite brand. 🙂 And the shoes are a great find, I love pumps with T-straps. Don't worry about the camera, I'd been using a very old digital one for ages, except for when my boyfriend took the pics with his DSLR. Now I'm able to borrow my parents' nice camera for some time, and it does have disadvantages too – heavy, difficult to handle, can be stolen etc. Your photos are nice anyways!